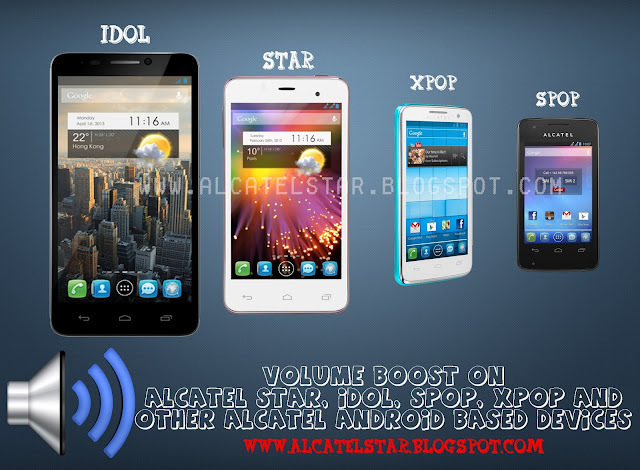 Do you want to modify or create new one bootlogo for your Alcatel STAR, IDOL or another MediaTek Android devices yes you're on the right place. 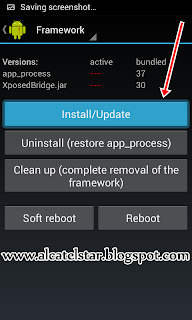 Today I am going to show you how to change easily bootlogo on your MediaTek device. 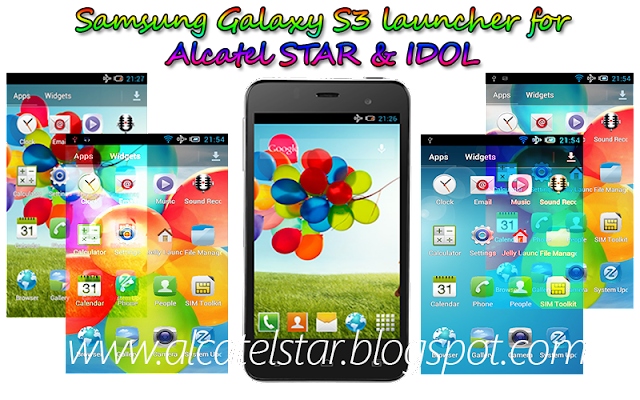 Bootlogo is first screen that you see on first booting on your Alcatel STAR, IDOL or other MediaTek Android device. Logo Builder is a PC tool with features for editing logo.bin & boot_logo. 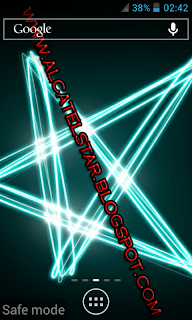 DISCLAIMER: We(alcatelstar.blogspot.com) are not responsible for any damage on your phone after following this TUTORIAL.DO IT AT YOUR OWN RISK!!! 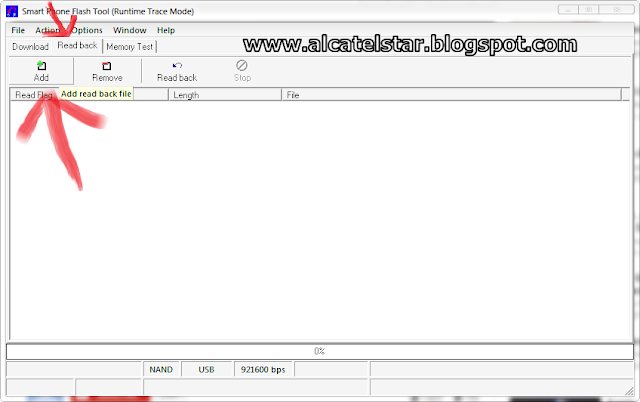 1.Extract zip somewhere to PC and launch Logo Builder. 2.Press Create new project and find your logo.bin file then save all contained images from logo.bin to anyplace on your PC. 3.You will see this screen after saving logo.bin contained images. 4.You can remove first image go to destination folder which you saved logo.bin images. note:dimensions of new image/picture need to should be the same with original file with extension png and same file name(img1.png on my Alcatel STAR) otherwise you will see a broken screen if you do not follow these recommendations. 5.After you replacing old images with new ones you can use Make option. On Logo Builder one of good features is making update.zip for easily flashing logo.bin via TWRP or CWM recovery. 6.Take your update.zip from folder that program saved and copy to SDCARD. 7.Boot into Recovery and install & Enjoy!!! 2.Choose your image that you like and save new boot_logo to anyplace then copy to SDCARD. 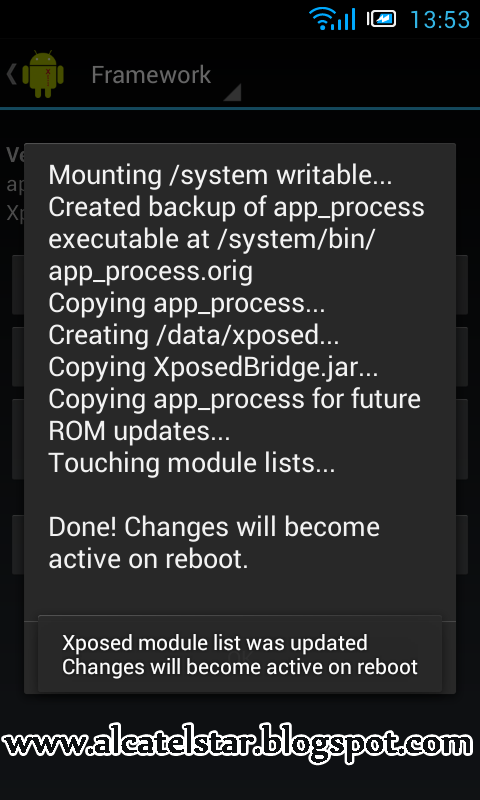 3.You need to manualy replace boot_logo to /system/media/images with old and set permissions to 777(all checkboxes). 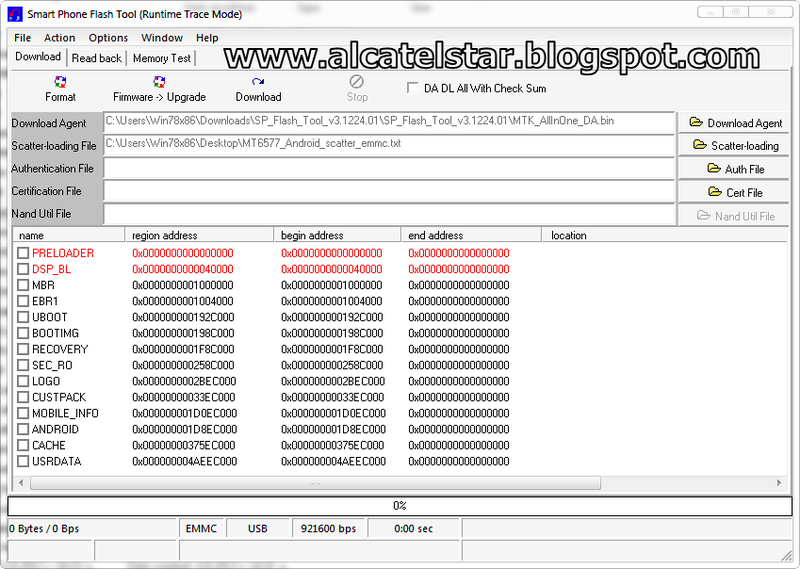 I noticed on Alcatel STAR 6010D(dual sim) attending application called Battery Saver and not exist on my Alcatel STAR 6010X(one sim). Let me introduce you with Battery Saver application. 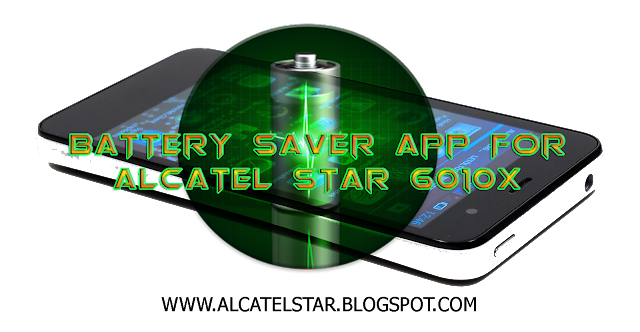 Battery saver is very useful app on Alcatel Android phones which lies concealed active in notifications show time remaining on Active use and current Mode. - General(Haptic feedback is on and orientation is on brightness level at 30%). - Optimal(everything's turned off & brightness levet at 20%). - Sleep(this mod will be turning off all Networks, Wifi, Data connection, Bluetooth, GPS, Auto-sync you can't make a call only set when you go to bed). You can set when power is lower than 10-20-30-40% to automatically switching specific mode. Another feature you can for a specified time switching mode e.g. from 22:00 to 06:00. A mode is a special setting that changes and affects battery life usage. General mode Optimal mode and Sleep mode are preset modes used to conserve battery life.These preset modes cannot be edited or deleted. New modes can be added, customized and easily switched out to fit your user needs. note: custom modes may not efficiently help extend battery life. Custom modes can be edited or deleted by long pressing the mode icon.Make sure that the mode has been deactivated and not in use before you deleted it. 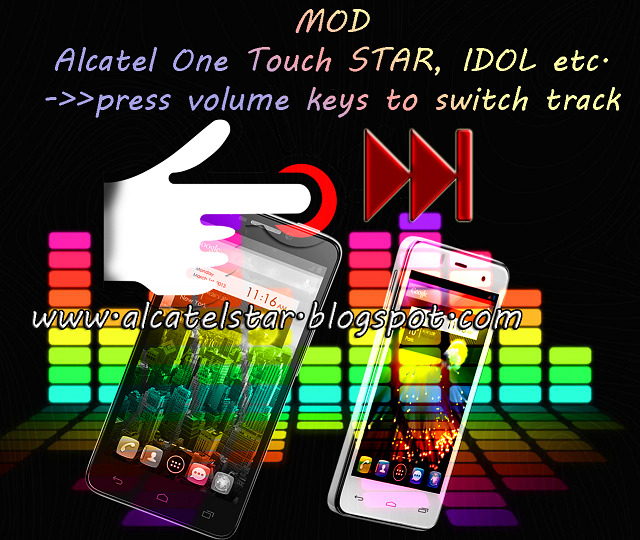 In the previous post we have described How to do full backup of Alcatel STAR, IDOL and etc. 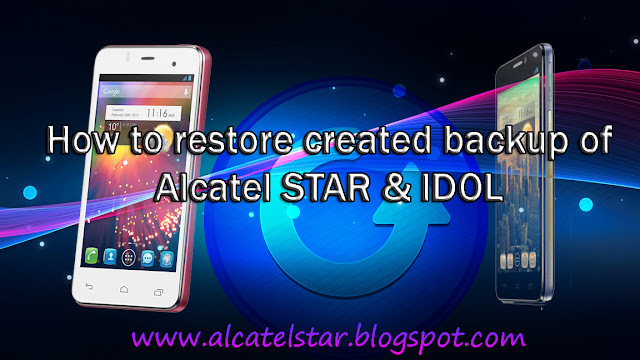 now we will countinue post by the following How to restore alreday created backup of Alcatel STAR, IDOL and etc.Let's all learn how to do this. Your warranty is now void after using this tutorial. 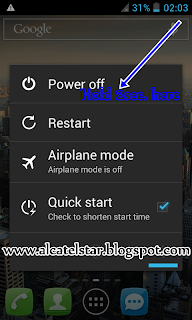 Install all above drivers or skip this step if you have already installed. 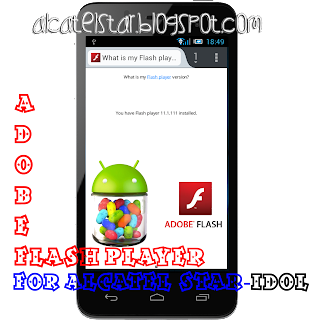 Install/extract Sp Flash Tool & MTK Droid Tools to somewhere on PC. Launch green Android icon from folder MTK Droid Tools and go to root, backup, recovery. Plug USB cable and wait to drivers to installed. 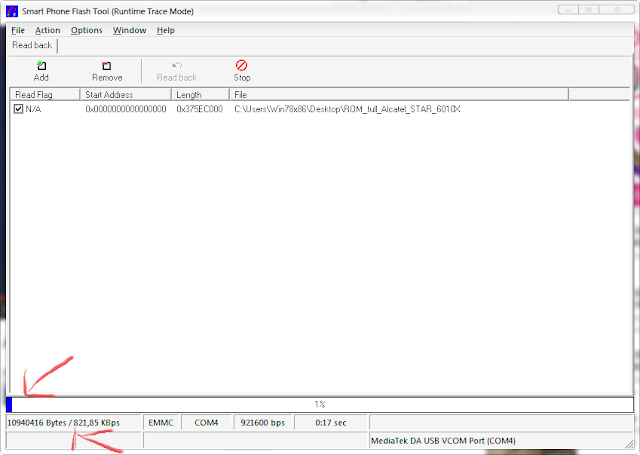 On root, backup, recovery scroll to down and look at "To proccess file ROM_ from Flash Tool"(this means To prepare files for Sp Flash Tool on the basis of the ROM file, received by function ReadBack in Sp Flash Tool) in a few words that means to split created backup in Sp Flash Tool into pieces in understandable variant that can be restore back to Sp Flash Tool so еnough talking let's continue choose ROM file. When you press on above option and load ROM file proccess will begin to perform spliting of files it will take about 5 minutes or less. 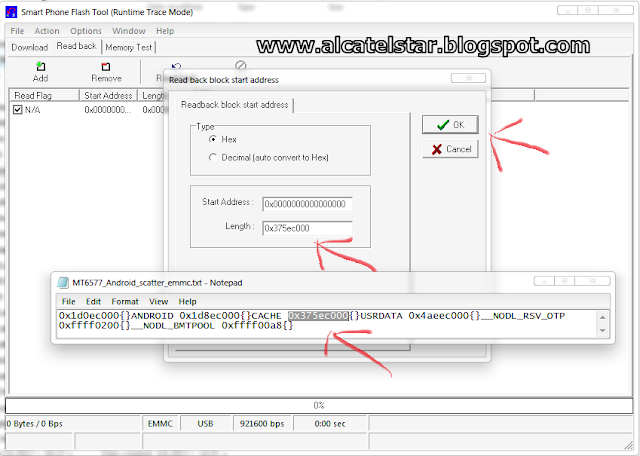 Launch Sp flash Tool exe from folder. Final screen will like next and press DOWNLOAD button to restore backup then plug USB cable proccess will take over 5 minutes. You will get message Download warning: Not all images are correctly loaded, which may cause boot up issue! Do you still want to go on downloading anyway ? VERY IMPORTANT: PRELOADER & DSP_BL IS DANGEROUS FILES NEVER USE THIS FILES FROM ANOTHER MODEL OF PHONE BECAUSE YOU WILL HARD BRICK YOUR PHONE AND YOU NEED TO SEND IT TO REPAIR SERVICE ALSO WARRANTY WILL NOT COVER THIS DAMAGE. 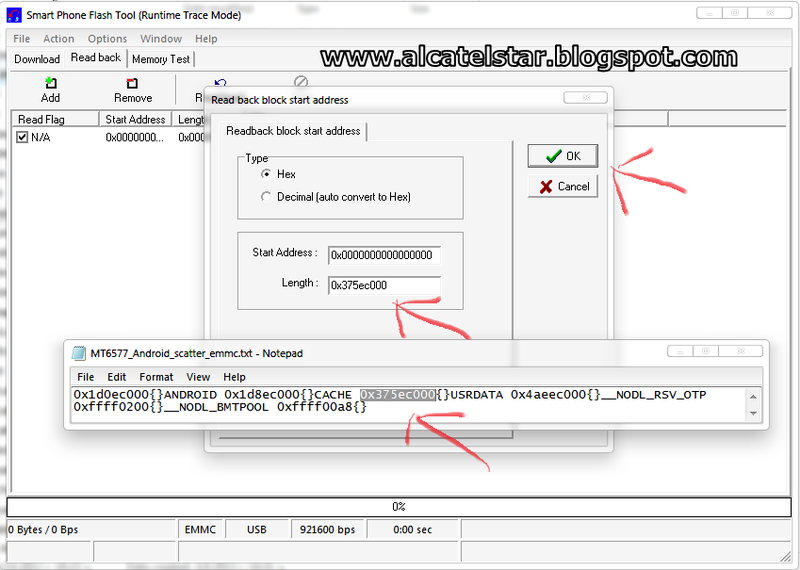 In this tutorial I will show How To Make a backup on whole system and whole partitions of Alcatel One Touch STAR, Alcatel IDOL, Alcatel XPOP, MPOP, SPOP and other MTK Android devices with by means of SP FLASH TOOL. Why do we need backup ? 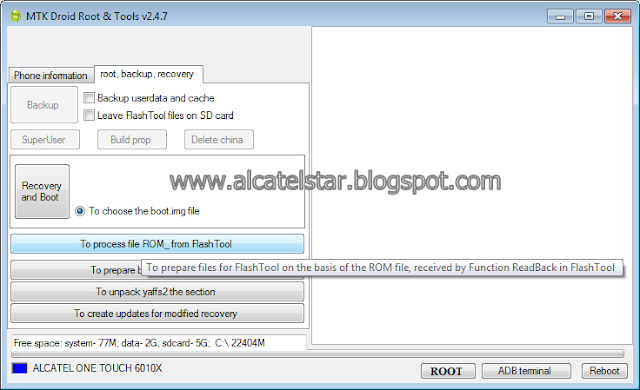 - If you have deleted or modified some files from phone after root. - If you experiment with phone system files. - If you need to return it for warranty for any reason it is necessary to have a default system files on your phone as it was purchased. 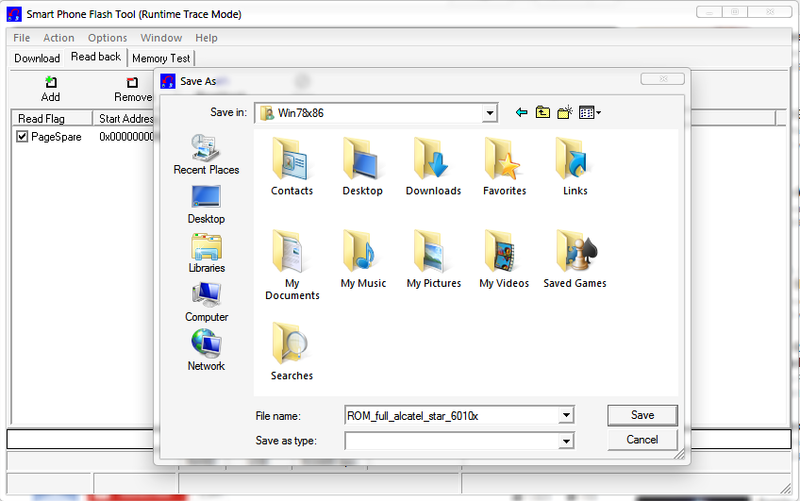 - Or just for any case, just you have a backup of whole system partitions files and folders. 1.Open Flash_Tool.exe from Sp Flash Tool zip archive. 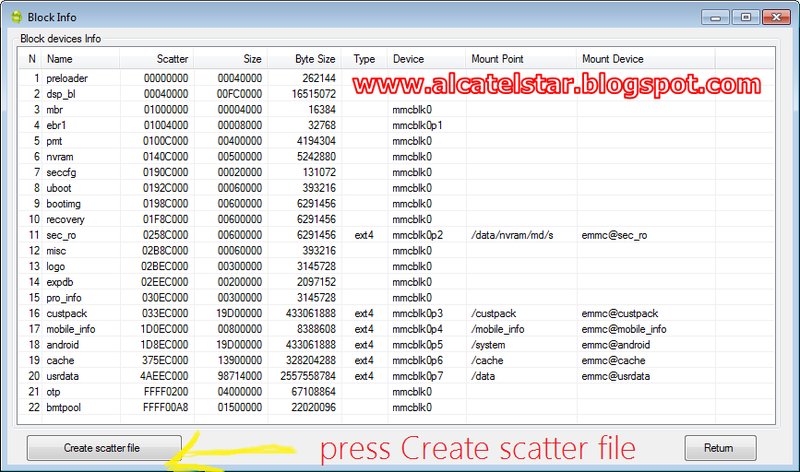 2.Go to top to file and select Open Scatter-loading file and find scatter file. 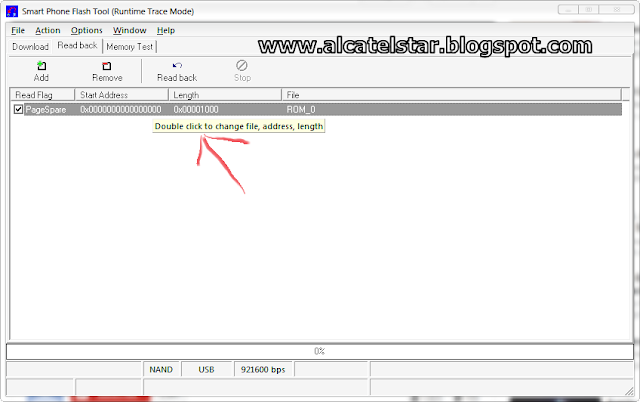 4.You will see this in the picture and "double click to change file, address, lenght"
5.In this step you can optionally set a name of Backup but after "ROM_"here your text and therefore press save button. 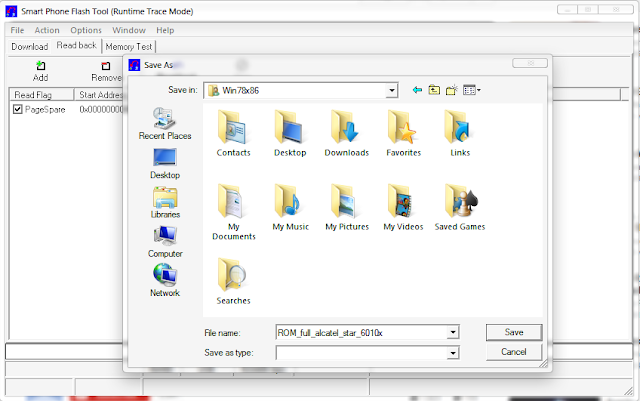 6.Now again will be appear another window with some settings see on picture below. Backup process lasts approximately 30 minutes drink a cup of coffee and it is ready. Finally will show a green circle means that the process is finished. note: for each device is different duration on some maybe 10min. 20min. 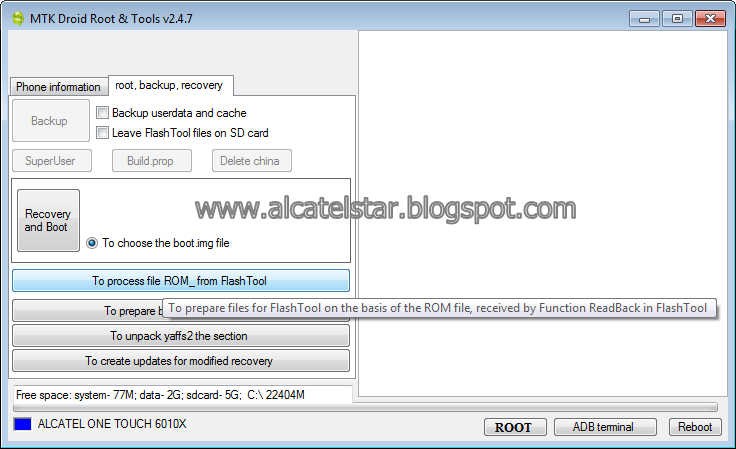 It does not end there at next post I will show you how to split created backup to ready for restore from Sp Flash Tool. 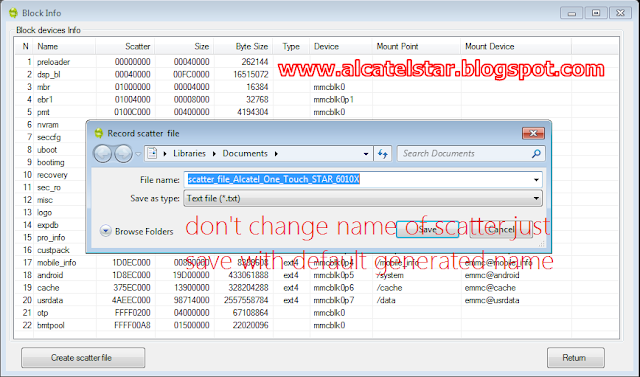 What is scatter file and where it is used ? 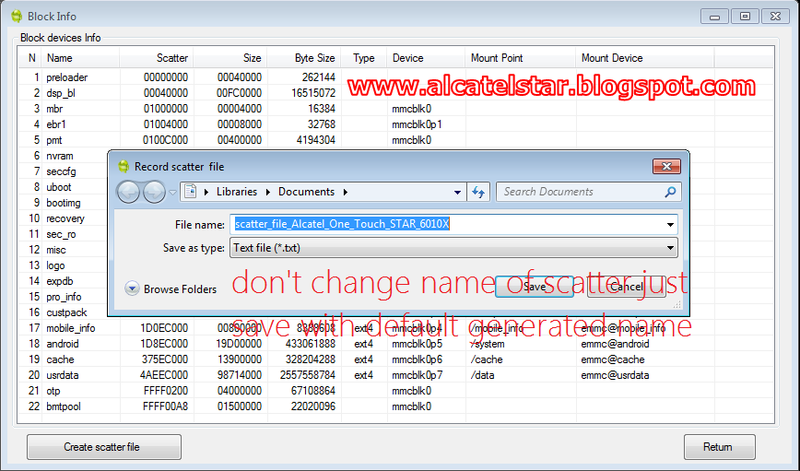 Scatter file is the text file with addresses of the blocks of phone. 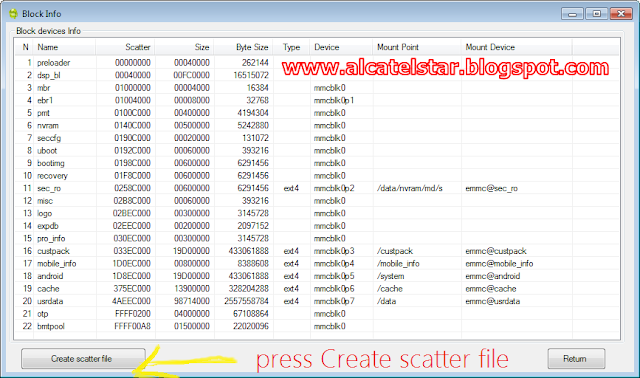 Scatter file is necessary for Sp Flash Tool for backing up phone or flashing custom Recovery, kernel etc. 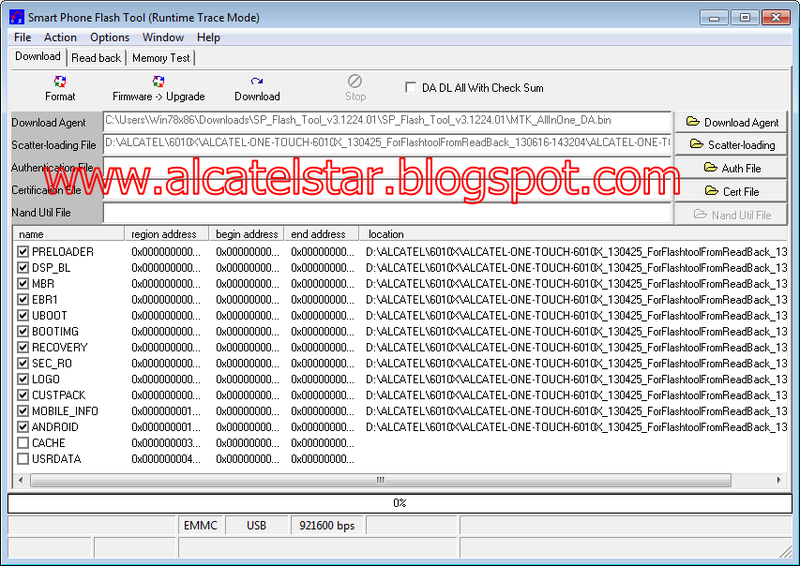 I will show to you how can create scatter file from MTK based device specially for Alcatel STAR 6010X. 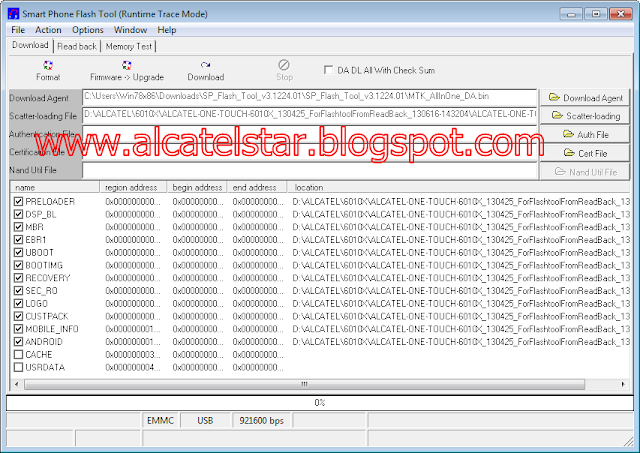 In this tutorial I using Alcatel One Touch STAR 6010X Android MTK for creating scatter. Plug usb cable and enable USB debugging (if you don't know where is this go to settings->about phone->advanced->debugging and tick usb debugging). 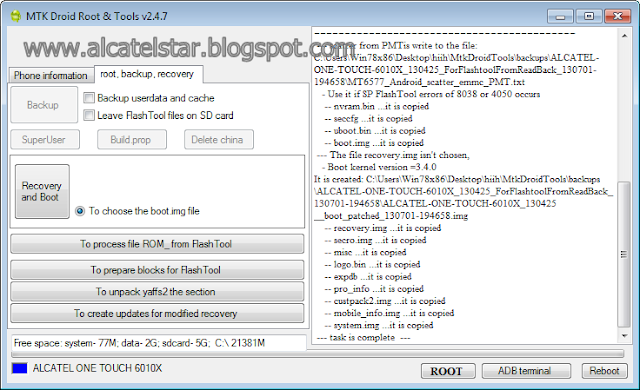 I'm going to show to all of you how to install easily CWM & TWRP custom Recovery without flashing image from SP FLASH TOOL. 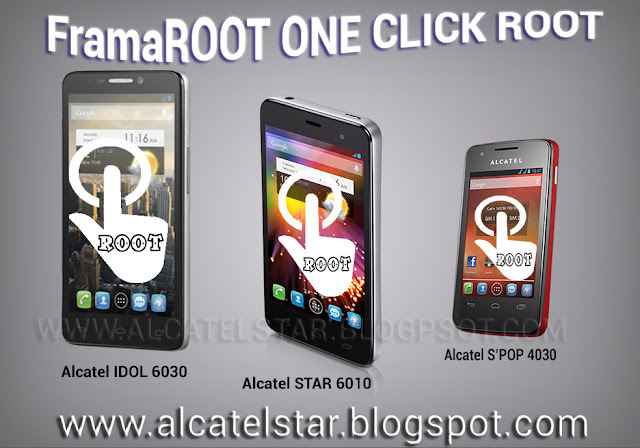 Now as you know how to Root, and probably have a Root with easy rooting method Framaroot on your Alcatel STAR, IDOL, SPOP, MPOP etc. or you don't have yet check this tutorial. Useful application "Mobileuncle" plays the most important role in this guide Download from Play Store Mobileuncle MTK Tools - link. And open Mobileuncle app after installing then grand superuser permissions. Go to 5 option "Recovery update"(this means will replace device stock recovery module when flashed from sdcard new recovery image file). Choose your recovery file will be with extension .img анд you will be asked with message "Are you sure flash recovery! and need to press OK. 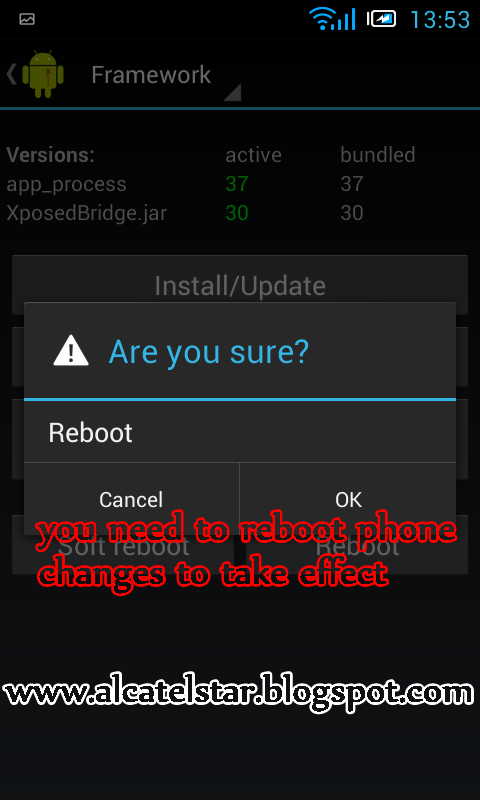 Wait to recovery replace and will be appear message Reboot into recovery mode you decide what you will do ! That's it ! ! ! 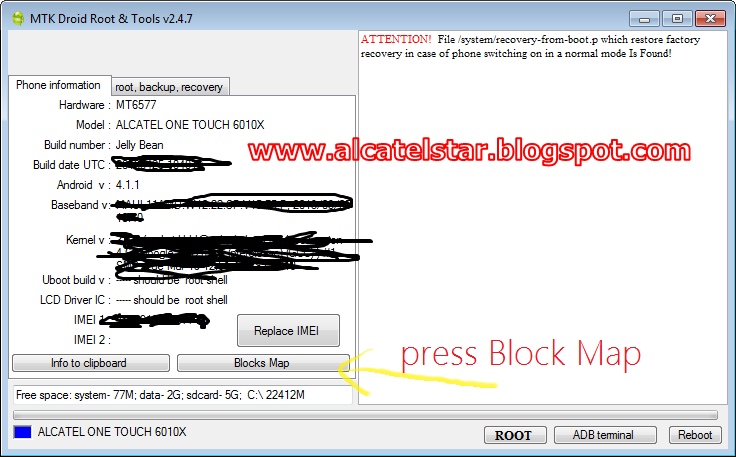 Framaroot new amazing one click root method for Rooting Alcatel One Touch STAR 6010, Alcatel One Touch IDOL 6030, Alcatel One Touch SPOP 4030 and may work with other Mediatek Android devices also you can check full compatibility list of the bottom link on original thread report if it works with your device. Actually Framaroot is an app which you install on your Android then you divide just one click to get to the Root. 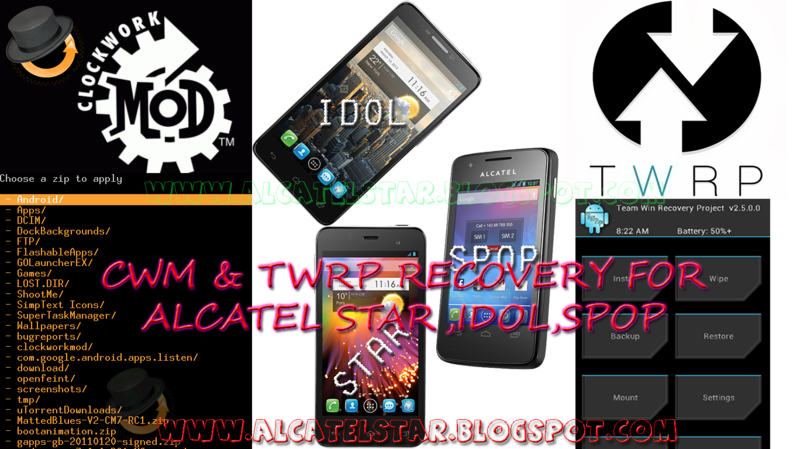 Rooting with Framaroot is very easy and does not need all these operations to flash the unsecured for Alcatel STAR, IDOL, SPOP(which have MTK CPU) or custom Recovery like CWM, TWRP.Believe it worked and of the my device not a joke. At first you need to download Framaroot app from Phone or PC - link. In phone go to Settings->Security->Unknown sources(Allow install of non-Play Store applications) and tick checkbox then go back and find with file manager Framaroot.apk and install it. Open Framaroot and choose what to be installed SuperSU or Superuser doesn't have any matter what you choose. Success:-) ... Superuser and su binary installed. 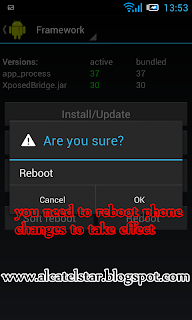 You have to reboot your device!!! 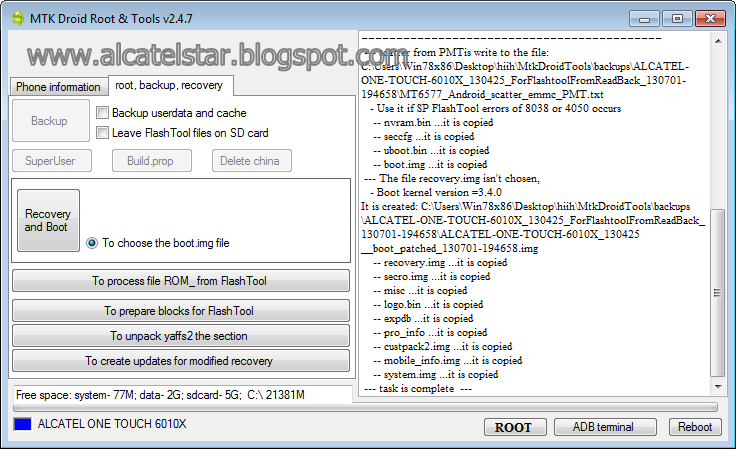 If you have already acquired the Root rights over the device you can verify Root rights with "Root checker" app - link. It's all as easy as ABC. 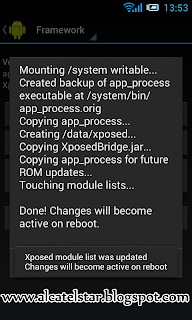 There are many ways to Root Android but not all working with success for certain particular Android Smartphones are required some specific techniques. whole system but you should know what you are doing. 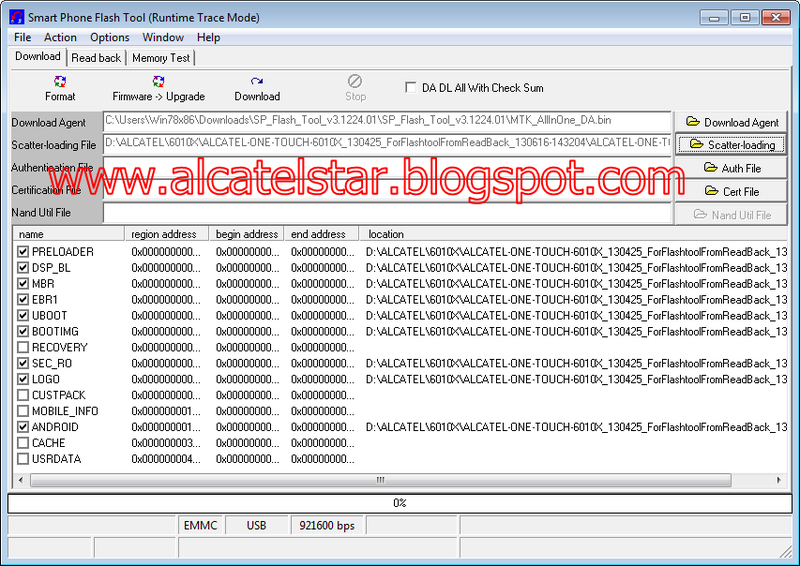 So, if you want to Root Alcatel One Touch STAR 6010X or 6010D follow the following Тutorial. Launch Sp Flash Tool blue icon. Go to scatter loading and find scatter file from CWM.zip archive. Go to Recovery section and press once with left mouse then load CWM.img file from CWM.zip archive. After loading scatter and recovery you need to plug usb cable and wait to drivers installtion. Download Warning: Not all images are correctly loaded, which may cause boot up issue!Do you still want to go on downloading anyway?One red and blue line will pass once this means that the file is satved in the NAND flash when finishing will appear big green circle with text DOWNLOAD OK and unplug usb cable. note: If you see an error on SP FLASH TOOL unplug usb cable and replug again and going to be Okay! Now boot phone into ClockWorkMod Recovery at turned phone with following buttons combinations VOL UP + POWER ON/OFF for 3sec. until will be displayed CWM recovery. Plug usb cable then go to root,backup,recovery if drivers are good installed at right corner with cyan color and text "Режим рекавъри"(that means phone is in Recovery mode). 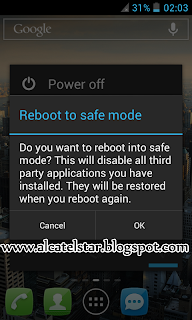 After all operations which were done finally press reboot button to root working!!! 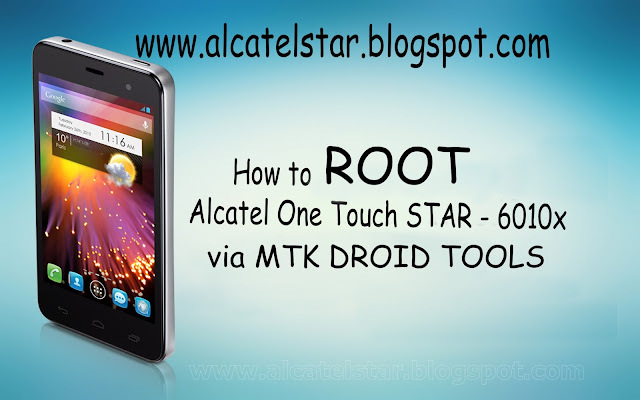 That's it Congratulations you have Rooted Alcatel One Touch STAR 6010X!! !